MODESTO, CA--(Marketwire - April 12, 2010) - It takes energy to endure a hectic, non-stop day. Whether you need to get through tough deadlines, long meetings, daily workouts or family-packed days, protein and fiber can give you the energy you need to win. This spring, Mitzi Dulan, RD, nutritionist for the Kansas City Royals and Kansas City Chiefs, and co-author of The All-Pro Diet: Lose Fat, Build Muscle, and Live Like a Champion with NFL player Tony Gonzalez, shares new ways to power through your day with helpful snacking tips. For her professional athletes, Dulan recommends foods with protein and fiber to help provide that extra drive they need for game day. One of the easiest ways to get that protein is by eating almonds. "Almonds are the perfect on-the-go food to help you power through a grueling workout, or work day for that matter," Mitzi said. "With crunchy almonds on hand, even the most active person can battle hunger anywhere, anytime." Enjoy a mid day boost. Toss a handful of slivered or sliced almonds over your salad or pack a power lunch with a Turkey Pita with Fiery Almond Sauce. Eat up and beat the 3 p.m. slump. Keep a re-sealable bag of flavored almonds in your desk or bring it with you to meetings to help ward off the desire to ambush your coworker's candy bowl. Get protein before your workout. Just a handful of almonds provides a powerful protein punch (6g). I recommend almonds to my players to help provide the stamina and energy they need on game day and every day. Have a smarter late night snack. Whether you're trying to make a deadline or winding down from a hard day, munch on some dark chocolate with a handful of roasted almonds to satisfy your late night cravings without undoing your whole day of eating right and exercising. 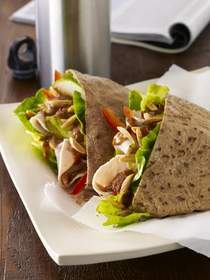 Line pita halves with lettuce leaves; fill with turkey, bell pepper, cucumber slices and almonds. Wrap sandwiches in plastic wrap and refrigerate up to 8 hours. Store sauce in a separate container and drizzle sandwich with sauce just before eating. To prepare sauce, place almond butter in small bowl. Add remaining ingredients and stir until smooth, using a fork. Sauce can be stored in an airtight container, refrigerated, for up to 1 week. Makes 1/3 cup. Contact Laura Healey at (202) 973-2978 or laura.healey@porternovelli.com for full-color, high-resolution photos of the recipe. Consumers all over the world enjoy California Almonds as a natural, wholesome and quality food product, making almonds California's leading agricultural export in terms of value. The Almond Board of California promotes almonds through its research-based approach to all aspects of marketing, farming and production on behalf of the more than 6,000 California Almond growers and processors, many of whom are multi-generational family operations. Established in 1950 and based in Modesto, California, the Almond Board of California is a non-profit organization that administers a grower-enacted Federal Marketing Order under the supervision of the United States Department of Agriculture. For more information on the Almond Board of California or almonds, visit www.almondboard.com. (i) Good news about fat. U.S. Dietary Guidelines recommend that the majority of your fat intake be unsaturated. One serving of almonds (28g) has 13g of unsaturated fat and only 1g of saturated fat.